It's a value for money scope that sits at the bottom end of the FT scope spectrum. The T50 is very capable up to 50yds and then tends to be a little vague on ranges out to 55yds. I know a shooter who rapidly climbed through the grades using his T50 on a Pro Target and you will see a few on the GP circuit. I bought a new T50 mk2 last year while my Leup was away being fixed. 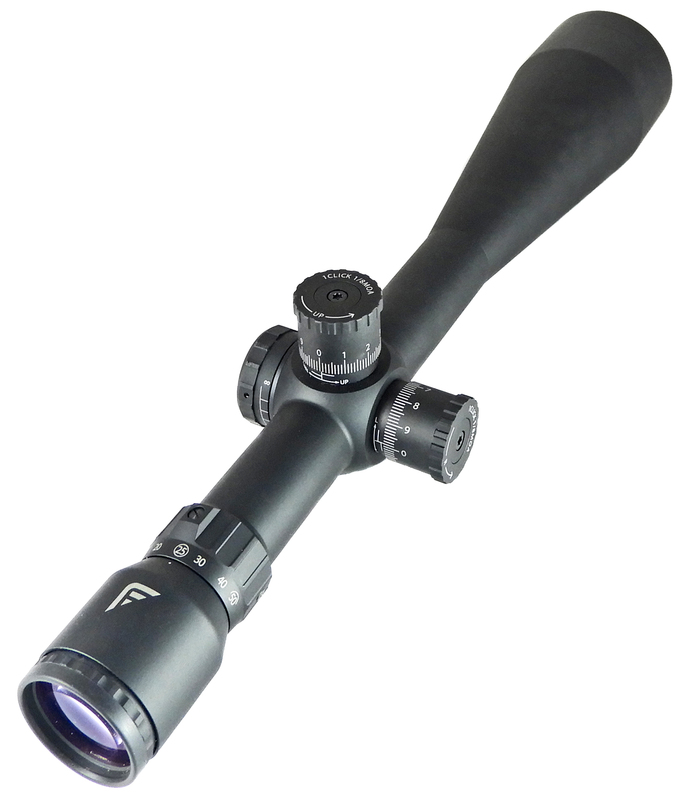 I thought it was excellent value for money and a great starter scope. In the two comps I used it in I came 2nd and first in my grade (B in SWEFTA), 2nd place was down to a schoolboy error on my part. I sold it on to a mate in my club after as I got hold of a Sightron. FWIW I shot with my Leup for two comps, borrowed Nikko for one (then it broke), Bought a Falcon T50 mk2 and used that for two more comps. Changed to a Sightron for the last two. I also won B grade; make of that what you will. As you are new on here and asking that question I'll take a punt that you're new to FT. Unless your pockets are huge The Falcon will definitely do, but, if you plan on actually winning something big you will eventually end up trading up for better more expensive glass. I wouldn't be blaming the Falcon mk2 scope if you don't start off with amazing scores put it that way. Good luck with whatever you end up choosing; scopes are funny things. I ended up selling my Leup for a new Sightron this xmas because the Sightron has more features that I found useful. Hi mukka I have been shooting at club level and the ft scene since 1980 lol so not really a beginner. I don't shoot competitions now but as my eyes are getting poorer my old leupold premier boosted scope is letting me down for ranging plus it does shift about due to heat . While the T50 is a great entry level scope for FT, the X50 is a completely different beast and is effectively a Sightron SIII for near enough half the dosh. I haven’t had chance to try one yet, but if it’s the same Sightron quality with a lighter weight then it sounds very good value indeed, especially as Jon Harris wheel is an option for not a lot extra. Cheers Colin, scrub my previous then! Sightron SIII for half the money! That's good news for me then with two SIII's. If I din't have bad luck I'd have no luck at all! Seen it now. Tricky, but looking at the optics warehouse site it doesn't mention a sidewheel so that's extra cost on top of the 699.00. I prefer the Sightron ret stadia myself but yes in all other respects it looks like a Sightron. Think I'd buy a secondhand (or new) SIII for that sort of money; unless the warranty is the same or better with Falcon. Speak to Optics though, see if you can try it. I haven't got time to check now as I need to go to work but I'd give them a bell. Okay, seen the sidewheel version now at 769.00! Sorry for butting in, but are you all saying this new falcon is essentially a sightron ? If so, is it better to buy this, than a second hand Big Nikko, as I am looking for my first FT scope and was considering a T50 to start, then maybe move to a S/H Nikko. would I be better saving up a bit and getting this X50 instead. Personally you're better off buying once and buying quality. The Nikkos are very good though can be a bit variable. This Sightron appears to be the real deal and is lighter than the original which is a bonus. What do you mean by “effectively a Sightron SIII”?? It's made in the same factory as the SIII and shares a lot of common features. Even though we think that scope manufacturers make products specifically for our air-gun market, the majority aren’t, we just hijack then for our needs. I’m guessing that this lighter Falcon is aimed squarely at the budget F-class shooter, so lots of recoil. If it’s anything like it’s bigger brother then the springs that hold the erector tube are the best in the business, so no worries there.